A further six people have been arrested over incidents of public disorder in Huddersfield on Tuesday night. Three people aged 17, 22 and 39 were arrested over an attack on The Chestnut Medical Centre, where a cash machine and money from the till was stolen. 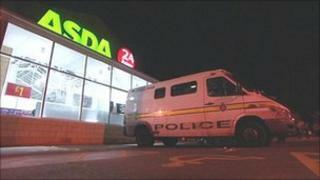 Three more aged 15, 16 and 23 were held on suspicion of damaging Deighton and Sheepridge Working Men's Club and stealing from the Bradford Road Asda. Police said there was no disorder or looting on the town on Wednesday night. Ch Supt John Robins said those responsible for Tuesday night's incidents had tried to "copy the disorder and theft seen in other parts of the country". He said: "We are pleased to be able to say that it was a lot quieter in Huddersfield last night. "I pledge to the communities affected by this disorder on Tuesday night that we will relentlessly pursue anyone suspected of being involved. Where we can, we will arrested them and bring them to justice. "As well as extra uniformed officers out and about in Huddersfield over the coming weeks to keep people safe, we also have dedicated teams of detectives who will investigate every report of disorder and criminality." Five youths who were originally arrested in connection with the incidents have been bailed while inquiries continue.